Check answer to 4 Pics One Word Daily Puzzles here. 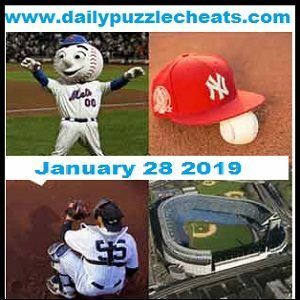 4 Pics 1 Word Jan 28th 2019 solution is solved based on the below 4 Clues. To check answer scroll down the page. For more 4 Pics 1 word daily Answers Click here. First Clue is a base ball with Red Cap. A Player preparing to play the baseball game. Empire wear dress to protect from base ball.